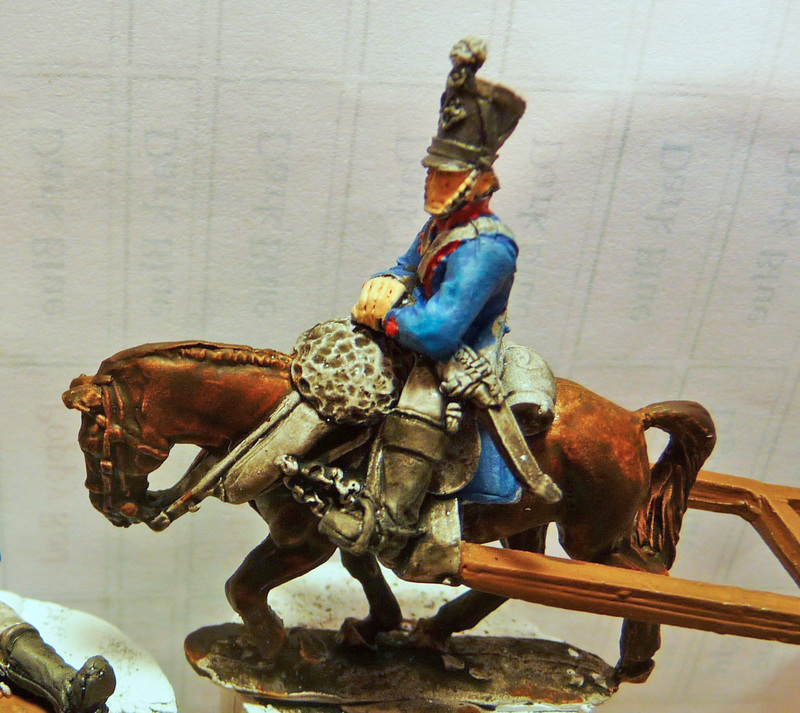 Well I have got a bit of painting done in the last couple of days. I have finished 2 more points of SAGA, got all my casualty figures migrated to round bases and re-terrained, painted and terrained 3 new casualty bases as well as started another unit of Hanoverians. 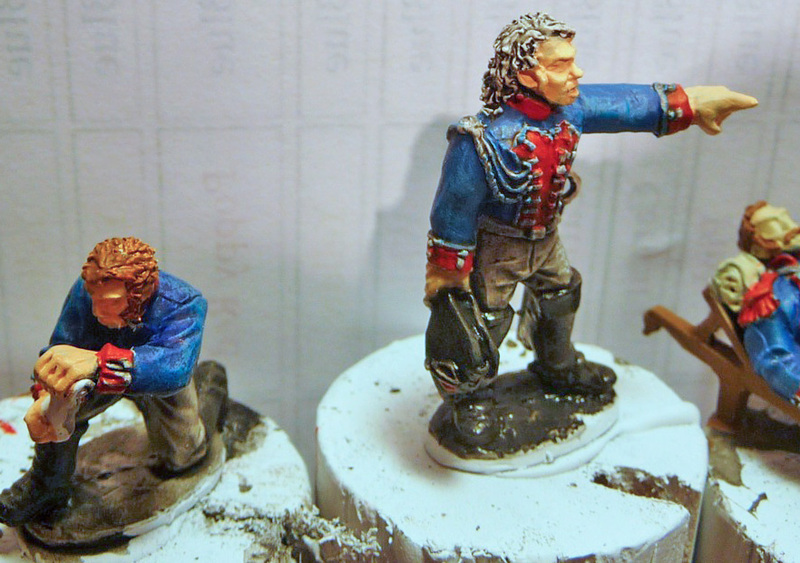 And yes, I put a bit more paint on my Barron Larrey project. I usually try to put 2 highlights on coats, and here I put some Vallejo Medium Blue followed by Vallejo Grey Blue. I have to do this first as I drybrush (have no idea how to layer) and it sometimes goes over to the trousers and cuffs. I next painted on the black, using Vallejo Game Colour Black which is quite glossy followed with a careful drybrush of Citadel Charadon Granite. I then carefully touched in thin layers of Citadel Blood Red, trying not to obscure the lace for the facing colours. Next up is the horse, I really like inks for horses as it saves me a number of steps and it gives what I believe to be a natural hue. I used Vallejo Brown Ink here. I am having some problems with this as I find Dullcote tends to invade into the ink and cause a cracked pattern despite using AP polyurethane as an initial finish coat. So what I have done here is to apply a coat of AP to the horse only. 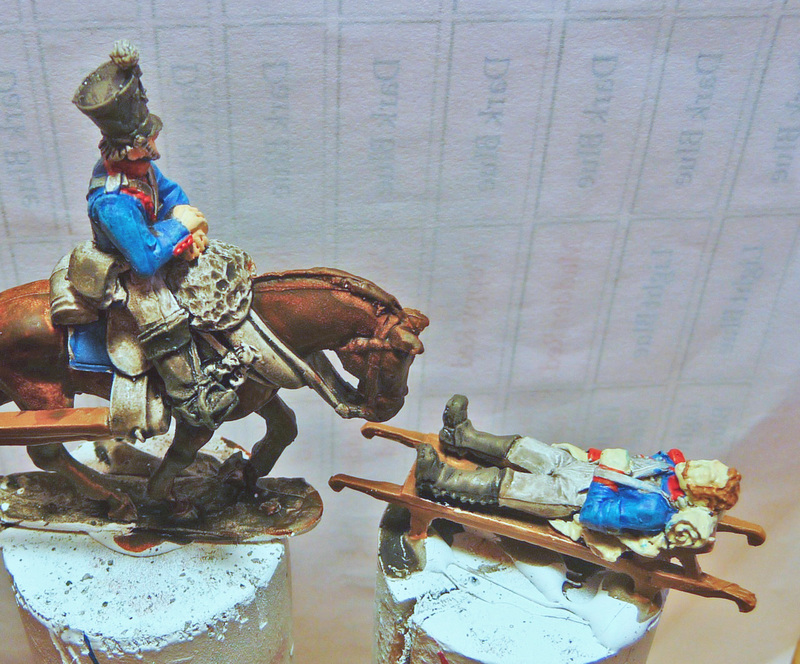 I will apply another coat when the figure is done. I am hoping 2 coats will solve the problem. 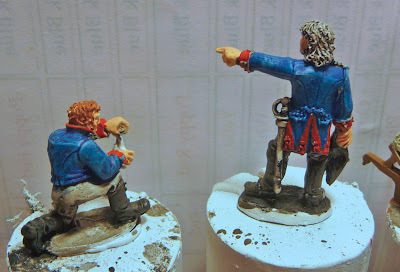 As you can see these are highly detailed figures, I am looking forward to the challenge of applying the white to turnbacks to raise the letter N.
I have also done some of the hair, I usually use lighter shades of brown and the AP works well with them. Still trying to decide what colour to use on Barron Larrey's hair, I suspect black, but still thinking about it. I will have some new SAGA photos tomorrow as well as some casualty markers in a couple of days. Looking good so far! Really looking forward to seeing it finished! They are coming along very nicely, John. I'm really looking forward to working on this vignette sometime in the future. Looking very nice so far!!! great work so far. I highly suggested you teach yourself the layering method. It will seriously take your painting to a whole new level. Use youtube or the Games-workshop new painting guide. Its expensive but really well illustrated and it also comes with a dvd showing the techniques(no, I don't work for GW). Hi Achilles the miniatures are from Warlord Games. I am hoping to get my first game of SAGA in sometime in October. I am really looking forward to it, I really enjoyed reading your reports.